And how far is too far when it comes to government secrecy in the name of security? These are just a few of the questions that have dominated American consciousness since Edward Snowden exposed the breath of the NSA’s domestic surveillance program. • Director of the National Security Archive THOMAS BLANTON looks at the impact of the Snowden leaks on the classification of government documents. • Former Assistant Secretary of State HODDING CARTER explores whether the press is justified in unearthing and publishing classified information. • Georgetown Law Professor DAVID COLE addresses the motives and complicated legacy of Snowden and other leakers. 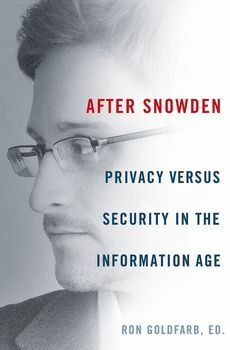 • Washington lawyer and literary agent RONALD GOLDFARB acts as the book's editor and provides an introduction outlining the many debates sparked by the Snowden leaks. • Dean Emeritus at the University of Florida Law School JON MILLS addresses the constitutional right to privacy and the difficulties of applying it in the digital age. • Pulitzer Prize winning journalist BARRY SIEGEL analyses the role of the state secrets provision in the judicial system. • Dean of the UC Berkley School of Journalism EDWARD WASSERMAN discusses the uneven relationship between journalists and whistleblowers. Seven experts examine the issues surrounding personal privacy and government security exposed by the Edward Snowden leak.